Gemini Film Circuits bags Vijay’s Thuppaki ? A hunt seems to be on for the lead roles in the Hindi version of 'Vettai'. The film will be remade in Hindi by director Lingusamy who knows commercial cinema like the back of his hand. It was earlier said that Salman Khan and Ranbir Kapoor will be approached for the lead roles but now grapevine is abuzz that the makers are toying with the idea of approaching Shahrukh Khan and Imran Khan for the remake in Hindi. The film's story features Madhavan and Arya as brothers - former as a peace-lover while the latter is a ruffian. Now going by the blockbuster status of the Tamil film, UTV wants to remake it for Bollywood with two top stars. 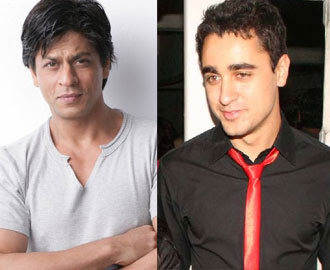 Since SRK and Imran have never attempted South remakes, the makers feel that these two will be apt for the script and also their casting will kick off some excitement. However, Madhavan seems to be keen on doing his role from the original in Hindi as well. As of now, talks are still going on about the cast, but a remake is for sure on cards. Actress Asin denied reports on her marriage with an industrialist based Chennai. Prabhu Deva is busy directing Rowdy Rathore and shooting of this film is fast progressing in Badami area in Karnataka. Since Prabhu is busy at the shooting spot and cannot visit his ladylove, the actress is frequenting the sets, say sources. According to reports, Nayan and Prabhu's love is strong as ever and the actress is travelling all the way from her hometown in Kerala to spend time with him. Sources also add that all is well between the couple and their relationship is strong as ever. The only question now is their wedding and both a mum about it. Director Bandi Saroj Kumar, a self-professed Ajith fan, is making a documentary on his idol. Bandi made his debut with Prokkalam, a film which had Kishore as the main lead. In the documentary that he is directing about Ajith, Bandi Saroj Kumar has taken the history of all the 50 films, right from this debut venture Amaravathy to Mankatha, which he had starred in. This documentary is surely going to be a tribute to Ajith and all his fans out there are going to enjoy it. When it's a mission to accomplish, the family of versatile actor Sivakumar comes ahead ensuring that everyone is benefitted. During all the critical junctures involved with the natural calamities and any serious situations, the family has got down to help everyone. Now with Government ensuring for the well being about the relief of Thane Cyclone affected regions, Tamil film industry has been extending its help. Yesterday Superstar Rajnikanth met Chief Minister J Jayalalitha and contributed Rs.10Lakhs for the relief fund. Today, the family members of Sivakumar including Suriya and Karthi personally met Jayalalitha and donated Rs.25Lakhs. 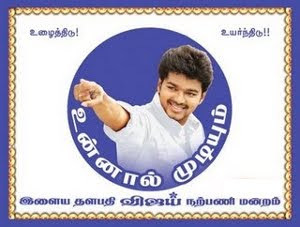 Ilayathalapathy Vijay's latest offering Nanban is drawing much crowd and has set the box office ticking but he has more reasons to celebrate . His upcoming venture Thuppaki's rights has been purchased by Gemini Film Circuits for a whopping amount. It is said that the distribution company was very much pleased to witness Vijay's star power with their home production Nanban and they are sure that Thuppaki will be perfect blockbuster since Vijay's performance is said to be utilized 100 % by ace director A.R.Murugadoss in this flick.Thuppaki is said to be a perfect blend of class and mass which will definitely entertain all section of audience. International Pop artist Pitbull will be lending his rocking voice to the Don. It is a season where artists around globe join together to mark a film's success. Now the Billa 2 is planning to do the same says sources. Pitbull the pop artist who rose to fame with his album M.I.A.M.I (in reference to the US town Miami). Now the hot news is music director Yuvan Shankar Raja who is well known for his foreign music troupe connections has approached the Pitbull team it seems. 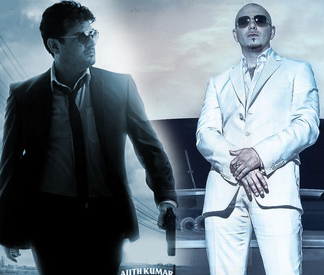 As per sources Yuvan has roped in Pitbull to sing the new version of My Name is Billa for Ajith's Billa 2. The song is said to be the highlight of the film of how David a gangster raises to the position of Billa the Don. Thala who has the looks on pair with Hollywood stars will make the song even more special with the voice of Pitbull adds trade circles. Suriya's Singam was a tremendous blockbuster and now the same duo combo is back to blow the trumpets of success. Director Hari according to the sources has penned a script that is so engrossing for Singam-2 that will surely grab everyone's interest. Earlier buzzes were that Amala Paul has been signed for the female lead character and now it has been confirmed that Hansika Motwani is Suriya's heroine. Within short span of time, Hansika Motwani has signed more projects including Vijay's Velayudham, Jeyam Ravi's Engeyum Kadhal, and Dhanush in Mappillai and now with producer Udhayanidhi Stalin in Oru Kal Oru Kannadi. Suriya onscreen chemistry with almost all the actresses have been best and for sure, this isn't going to be an exception.